We love working with non-profits. We got our start in the non-profit world. Helping an NGO to broadcast their message and enhance their mission is an authentic benefit of the job. 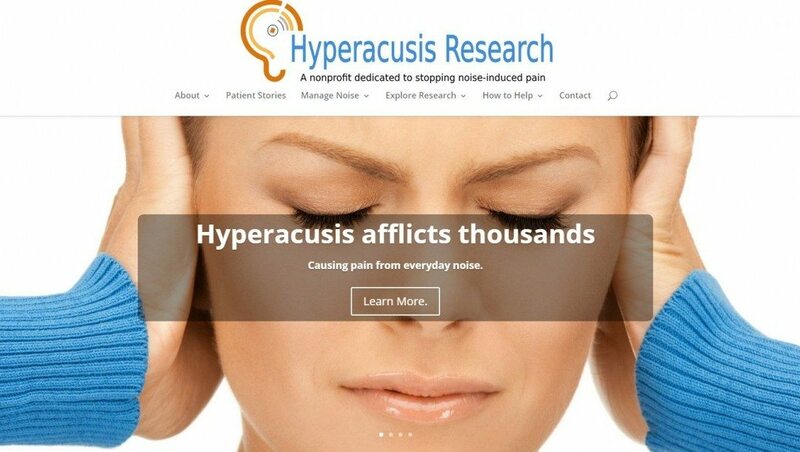 Enter Hyperacusis Research Limited, based in Massachusetts. Its mission is to help those with the debilitating condition of ear pain resulting from experiencing every-day noise. Before assisting Hyperacusis Research, I truthfully did not know of this condition, but I understand how deeply it impacts those who suffer from it. HRL’s former website, pictured here, was an approximately 30-page Joomla site. The software was a bit out of date, as was the design and, importantly, the site was neither mobile-friendly nor user friendly – for visitors or editors. HRL accepted bids from a number of design agencies and chose ours, for which we are grateful. We took their existing content and converted it into a WordPress website. We used the flexible Divi theme from Elegant Themes. While Divi does add a layer of complexity to a WordPress site, it enables terrific and nearly limitless design options right out of the box. Though not contemplated in our project, we also added a few new pages of content at no extra charge. The new site is cleanly designed and responds to screens of all size (it is “responsive”). Hyperacusis Research’s site is now mobile ready, handsome, easy to navigate, and fully functional. Social media and social sharing, along with email newsletter subscription, are fully integrated. So too is a simple PayPal donation button. We provide many of these attributes for many of our clients, but it was particularly nice to do this for HRL, an organization dedicated to improving lives. Like many of our clients, HRL opted for some WordPress training as part of the development package. They also selected our managed care hosting whereby we take care of the technical aspects of running a website. I encourage you to check out HRL’s new site at hyperacusisresearch.org. You can learn more with this Washington Post article about hyperacusis. Does your Nonprofit need a Website Update?